We've made a prototype module to show what browsers users are using to access DVSA content on GOV.UK. Right now this is only visible on the dashboard for DVSA web traffic, but we're planning to roll it out across dashboards for transactions and department and agency web traffic in the next few sprints. Now when you sign in to the admin app, you immediately see a list of the data-sets you can upload into. We did this by adding data-set upload permissions to admin app users. We've also added the ability for admin app users to upload data via CSV. This isn't that robust yet, but we'll be improving it in the next sprint. 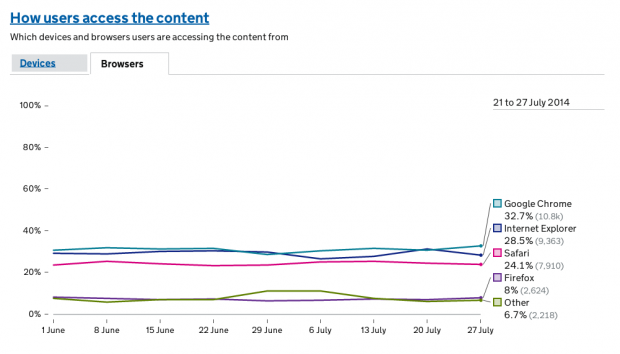 As well as seeing how many people click each help topic, you can now see the percentage change on last week. 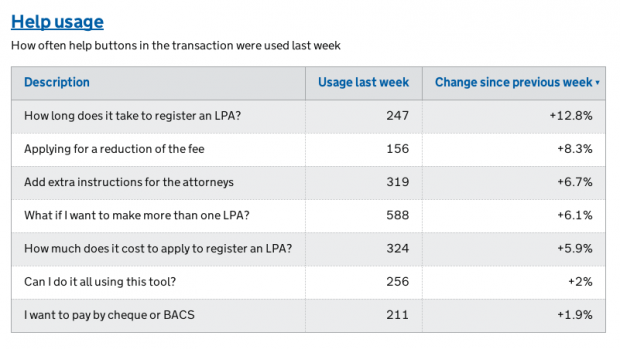 Take a look on the Lasting Power of Attorney registrations dashboard. We'll be adding functionality for creating transaction dashboards. At first, this will be limited to just the Performance Platform team. We'll be starting with the actual dashboard creation and editing the dashboard title and description, with a view to adding support for all our various modules one by one until we've got the complete set. We'll also be adding clearer error messages if you upload data that we can't handle. No more internal error mystery error messages. We're working on sending email notifications. 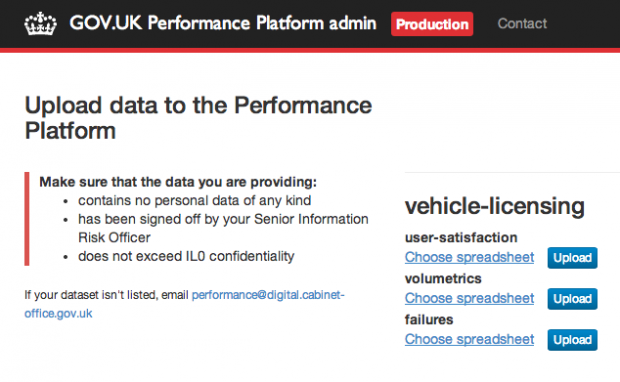 We're starting with emails to tell dashboard owners that their data is out of date. Longer term, we're planning to let people subscribe to dashboards to get summary emails showing how that transaction has been performing that week. That's it for this sprint. See you on the 25th August!